2005 Beaver Patriot Thunder 40' Wilmington with Quad Slides ***Caterpillar C13 525 hp. option with Side Draft Radiator***Allison AD4000 MH 6 speed transmission ***Only 59,274 Easy Miles******Fiberglass Capped Roof with Full Body Paint***10 KW Onan Diesel Generator with only***150 gal. Fuel Tank***Aqua Hot Diesel Heating System With new burner*** (2) Ducted Roof AC units***Power Awning with 4 Slide-out Toppers***Alcoa Aluminum Wheels***4 Door Fridge with Ice Maker ***Corian Counter Tops***Washer/Dryer*** (3) Fantastic Vent Fans*** 2 stage Engine Brake***Xantrex Power Inverter***Day-Night Shades/ Roman Shades***Microwave Convection Oven*** Ultra Leather Captains Seats with Power***Power Mirrors with Heat*** Collision avoidance system***(3) Large Solar Panel***Tow Package with custom heavy duty 30000 LB hitch for all your towing needs *** Power awning system 22' long***HWH Computerized Leveling System***(2) Color TVs upgraded, DVD and VHS players***Power Front Visors***Rear View Camera*** Power Dump Valves***Dual Pane Storm Windows*** 50 amp. 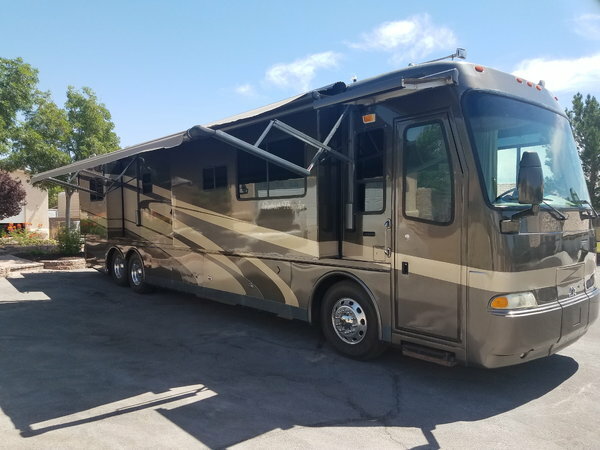 Power Service with Power Reel System***Trac Vision Dome Satellite Dish***Full-Bay roll-out Storage Tray*** This is a Truly "Must See" High Line Motor Coach!